Pinterest can be a dangerous thing. In the best way, of course. After seeing some decoupaged crates on Pinterest, I knew I had finally found something to replace the dilapidated baskets we use to hold firewood. A couple years ago, I had purchased some pretty napkins at Ikea but never used them for the project I had in mind at the time. (And I hate printed napkins for mealtime. They're pretty as can be but all that ink makes them useless for cleaning food off my face.) I was excited to try them on crates. But first, maybe I should try a smaller project? I ended up peeling the torn napkin off the tray and throwing it away. Next I tried scrapbook paper and wallpaper border. It isn't perfect, but I'm happy enough with it. 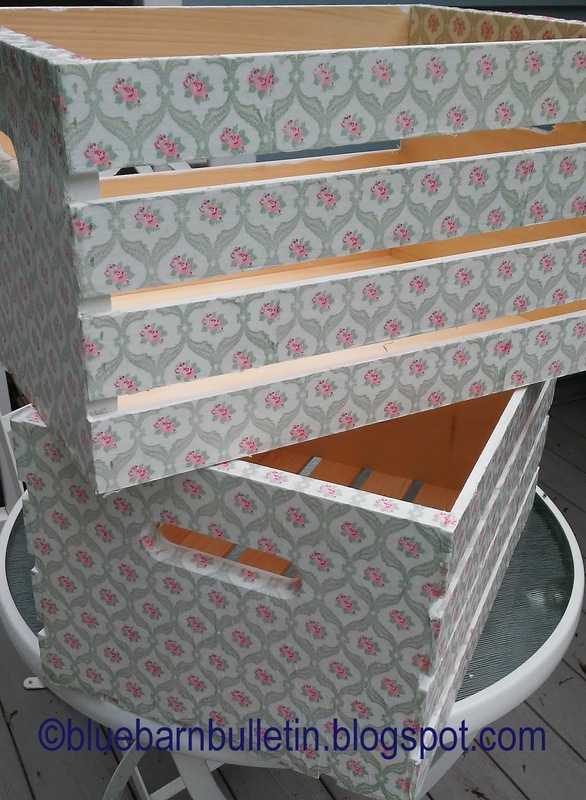 I scouted around on Pinterest for decoupage advice and found a few tips that gave me hope. Then I went to Joann Fabrics last Saturday and found crates half-off. Deep breath. Maybe I could make the napkins work? Half-off makes it a pretty small waste of money if it didn't work. And they'd still be functional, even if I couldn't pretty them up, right? So, I brought two home. I finished putting the napkins on tonight. More coats of ModPodge and they'll truly be finished but I'm pretty delighted with how they look. I pulled out a jar destined for recycling and a small napkin printed with chevrons today...and considered. Yep, I'm pretty sure decoupage is a disease. This is one of today's blessings. In the spirit of full disclosure, I must admit I didn't pick a single one of them. We have a neighbor who has a couple of apple trees growing by the ditch of his field. He always graciously allows us to pick however many we want and I make him a pie to thank him. We try to pick them a little green (because they get mealy fast) peel, slice, and stick them in the freezer to use all winter. Allison often ends up doing the bulk of the prep and also uses most of them when she makes little canning jar pies for Clarence for every gift-giving occasion. It's a sweet tradition I know he hopes won't end anytime soon. If you look closely, you'll see spots on some apples and apples that are oddly shaped. I guess they aren't very pretty, are they? What I see when I look at them is free, organically grown apples, generously shared with us by a kindhearted neighbor we barely know, that will be a tasty addition to many things in the months ahead. I am very thankful for these ugly (but I think beautiful) apples...and the man who thinks we're a little strange to want his ditch apples but shares them with us anyhow. Earl and Kathy invited the girls to spend the night at their house Friday night. Not only that, Kathy offered to bring them back home today, leaving my car available for me and saving me the long drive to pick them back up. I was very appreciative and decided to whip up some lemon curd as a token of my thanks. As I looked up the recipe, I was reminded that a friend of mine requested the recipe recently and I decided I could perhaps post something on my blog at long last as well. Win-win. The recipe I use couldn't be easier-throw the ingredients into a pan, stir over low heat until thick. Voila, lemon curd. I first made it for our FIAR group almost 10 years ago, when we read "The Secret Garden". I discovered it in a recipe for Lemon Curd Tartlets from "The Secret Garden Cookbook-Recipes Inspired by Frances Hodgson Burnett's The Secret Garden" by Amy Cotler. I've made it several times through the years, seldom bothering with the tart shells (although it's delicious that way), mostly just whipping up a batch or three of the curd itself. Whisk together the egg, egg yolk, sugar, lemon zest, and juice in a small saucepan. Add the cold pieces of butter and place over low heat. Cook about 10 minutes, stirring constantly with a rubber spatula to prevent sticking, until the mixture just coats the back of a spoon. Do not boil! Immediately remove from the heat and scrape into a small bowl. Press plastic wrap over the curd to prevent a skin from forming. Place in the refrigerator. I've also made lime curd, subbing lime zest and juice for the lemon, which is wonderful, too. We like the curd on lemon poppyseed scones, Allison likes it on toast or crackers, and one of the best ways to enjoy it is on a spoon. What would you put it on? Last Sunday, when I walked into the sanctuary at church, there were some unusual things on a small table up front. A pitcher of yellow liquid, a pitcher of blue liquid, and a jar with a bit of water in it. During the sermon, the pastor took each of the pitchers and poured them into the jar, filling it to the top as an illustration to go with what he was saying in the sermon. Allison was reminded of seeing people pour colored sand into a container at weddings in lieu of using a unity candle. Being someone who doesn't like the idea of keeping a lot of sentimental doodads, she doesn't someday want a jar of colored sand that she has to keep, just because it was a symbolic thing at her wedding. Put punch components up front at the wedding. Bride and groom each pour into a punch bowl, then the guests drink the punch at the reception. Ever have those nights when you can't get comfy enough to sleep? Or you get to sleep, only to wake a couple hours later needing to find a new position because the one that was comfy when you fell asleep is now causing you pain? That was me, several months ago. My solution was to get a recliner for the living room in hopes that I could sleep, or at least nap, in it when I wasn't sleeping well in my bed and keep from disturbing Clarence's sleep as well. We went shopping for the perfect sleeping chair. I liked the first one I tried the best-until I went back to try it again a couple weeks later, at the end of a shopping trip, and found it was only easy to use when I wasn't fatigued. Back to square one. Clarence suggested I needed to reconsider the motorized chairs I had already shunned. While I was in town one day, I stopped back by the local furniture store to take another look. When I mentioned that I was now considering an electric chair, my salesman was quick to chuckle and tell me that they call them "power recliners" as it sounds much better. During the several weeks it took for the chair to arrive, a friend sent me the pattern for a neck pillow, advising me that it was absolutely necessary if I didn't want to be sore from sleeping in a recliner. My chair arrived just before Christmas but I still hadn't gotten around to making my neck pillow. Yesterday, I ended up taking a nap in my chair. I'm happy to report that it's a very comfortable chair for sleeping but when bedtime rolled around, I had a lot of soreness in my back and arms. I thought about my neck pillow, already cut out, just not sewn together. If you're interested in making one, I used the pattern/instructions found here. It's been a long time. There have been several reasons I haven't been around but who wants to hear tales of health, or busyness, or that I've hardly taken a single picture in months (therefore, I can't blog, right?). I went grocery shopping yesterday. (It's shaping up to be an exciting post already, isn't it?) I do most of my shopping at our local Kroger which has undergone a major remodel over the past several months. After all the dust and clutter, it's finally been done for a couple weeks. The remodeled store is really nice but I don't think they left a single thing in the same place so I spend a lot of time going back and forth, between forgotten items suddenly remembered (I stink at having a good list) and the totally new layout of the store. Yesterday, I decided to walk back to the produce area to look for something and my path happened to go through the floral area. Kathy always finds great deals on flowers but I never see anything like she finds. Until yesterday. I was sure the $1.00 price tag was a mistake until I realized that there were several of them, all marked down to $1. Between the deer, chipmunks, and whatever other critters live around our property, most of the tulips we've planted are long gone so I'm going to enjoy having tulips again, inside where the animals can't steal share the enjoyment. As the snow keeps falling today, I'm going to pretend that spring is almost here. I have the tulips to prove it! Last Sunday was Allison's commencement ceremony. She shared the day with two longtime friends, which made it extra nice. I stressed about the details ahead of time, mostly the question of what I might be leaving out of my planning. We used the program from Julianne's graduation as our starting point but I had niggling worries about what I was forgetting to do that I didn't even know I was supposed to be doing. The worries were for naught as everything came together beautifully and the kids were happy with it, which was really all that mattered, right? Each of the graduates agreed to do a special musical piece. Julianne played for Allison as she sang "He Leadeth Me". Molly played guitar and sang, Josh played a cajon (that drum box you can see behind Allison) while his brother played guitar and a friend sang. With only three graduates, it was nice to be able to see each of them share their talents. Each of the grads had a customized cap. Allison made hers-she used a pink paisley with a little glitter in the design...perfect! Molly enhanced her cap with "Now I'm like this cylinder-we're both graduated" and a drawing of a cylinder. Josh had Star Wars fabric on his cap, which totally surprised me because I don't think he knew the girls were doing anything unusual with theirs. I loved their creativity and individuality. This is the FIAR friends group shot. Our group dwindled down to these three families the past few years and it's amazing to me to think about how long these kids have been friends. I'm so glad Molly made sure they were invited. We were delighted that so many people we care about were able to share in the day. Their presence was so appreciated as we marked this milestone in Allison's life. I am married to my best friend and homeschooling my two lovely daughters. We also have a grandson and granddaughter, thanks to my stepdaughter and her husband. This blog will probably talk about all of them at some time or other, as well as what's cooking around here, activities we are involved in, projects we are working on...the daily stuff of our lives. Yes, we do want children!! !